The table lists existing junctions for the selected vserver (1). You can sort the table by any column heading. Click the triangular control in the left column to show or hide junction details (4). Suspend a junction, or unsuspend a junction that was previously suspended. Click the links in the list above to skip to the sections below with details about each of these tasks. On a cloud core filer, only one export (/) is available to the Avere system. This export corresponds to the cloud bucket that contains all of the stored objects in a flat filesystem. However, with Avere OS you can use the global namespace feature to create virtual subdirectories, as described below. To provide more flexibility to clients accessing cloud storage through an Avere cluster, Avere OS allows administrators to create a hierarchical pseudofilesystem in the GNS. That is, you can create subdirectories in global namespace junctions that do not actually exist on the cloud core filer. When creating a junction to cloud storage, you can use both the Namespace path and the Export subdirectory fields to customize the virtual filesystem. The Avere cluster treats these paths as if they were actual paths on a hardware core filer. If SMB (CIFS) will be used for this junction, you also must know the name of the SMB share for the core filer export or subdirectory. Additional requirements are described in the SMB access control step. 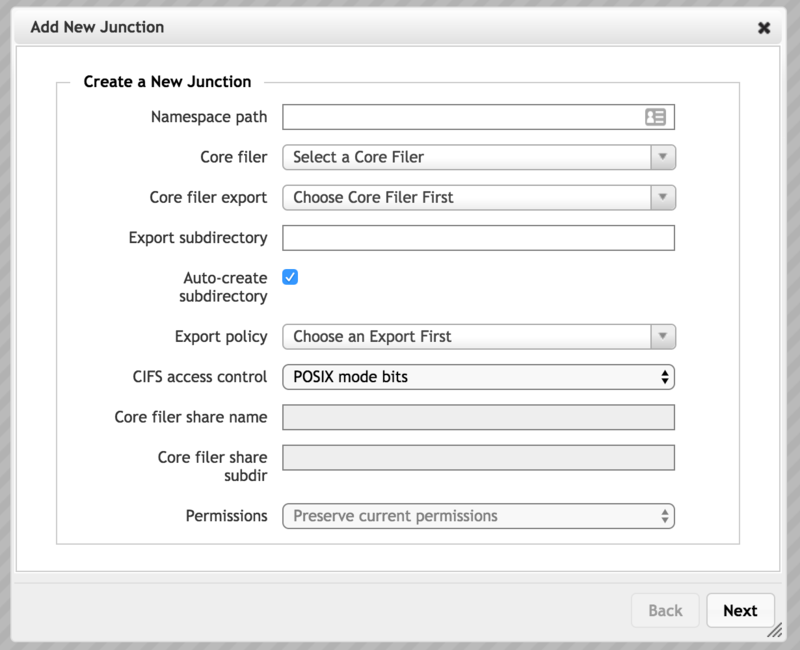 In the Core Filer list, choose the back-end storage system to use for this junction. From the Core Filer Export drop-down list, choose the export that clients will access at the virtual directory in the Namespace Path field. 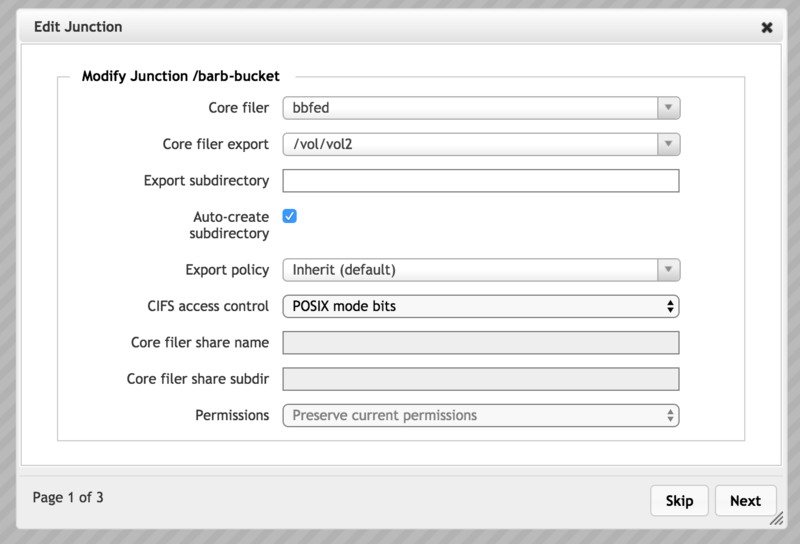 For a NAS core filer, you can select an existing NFS export, but for a cloud bucket you must select /. This setting works with the Export Subdirectory field to set the path exposed by the junction. Avere Systems recommends specifying the export closest to the root of the core filer, and using the Export Subdirectory field to define the path to the subdirectory that you want clients to access from this junction. Although the end result is the same for client access, some tasks related to data migration and SMB access are more straightforward when a higher level export is used. For example, imagine a core filer with the exports /vol/dir1 and /vol/dir1/subdir1. To create a junction that allows clients to access files in /vol/dir1/subdir1/, you should select /vol/dir1/ in the Core Filer Export list and enter subdir1 in the Export Subdirectory field. This configuration is preferred over selecting the export /vol/dir1/subdir1 and leaving the export subdirectory field blank. If you enter a value in this field, the namespace path will point to this subdirectory instead of to the core filer export directory. This value is relative to the core filer export path; do not enter a leading backslash (/). If the subdirectory does not exist, the Avere OS software can create it. Make sure the Auto-create Subdirectory box is checked. This setting can be important for core filers that only provide one export, at the root of the filesystem (/). Cloud core filers and some hardware solutions export only the root directory. The junction-level export policy feature allows administrators to create a virtual subdirectory in the global namespace for user access. You can assign more restrictive access permissions to that subdirectory and avoid exposing the core filer root export. If you do not customize the access policy for a virtual subdirectory, you must grant clients the access privileges they need on the root export so that the subdirectory can inherit the necessary privileges. This configuration gives clients access to every file stored on the core filer. If this junction will be used for SMB (sometimes called CIFS), configure the junction’s SMB access control method. For a cloud core filer, you can choose either POSIX or ACL security style. Make sure the options in the Permissions field are correctly set for the security style you choose. The SMB share should reference the exact same directory that was selected in the Core Filer Export setting. If the SMB share is for a different directory (for example, a subdirectory of the export), creating a FlashMove or FlashMirror job can fail. If you used an export subdirectory, enter the same value in the Core Filer Share Subdir field. Do not enter a leading backslash (/). 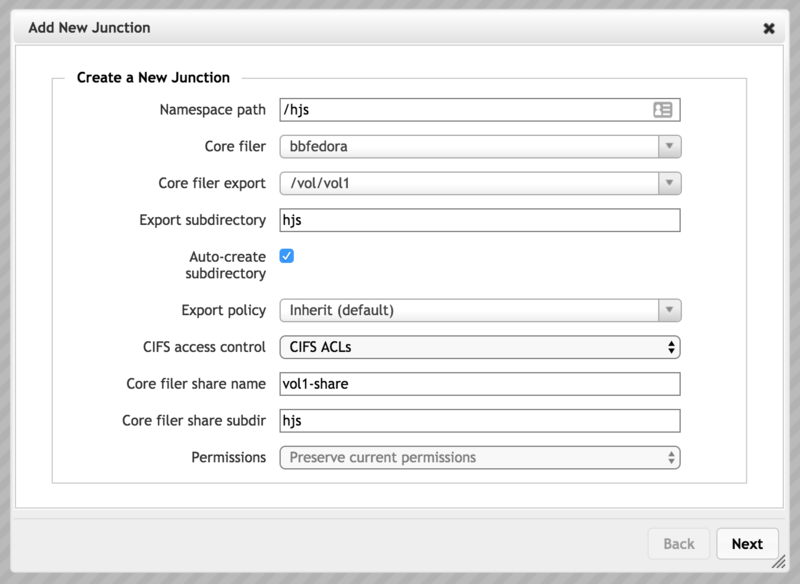 The system combines the core filer share name and core filer subdirectory to create the SMB path for this junction. Click the Next button to submit the changes. 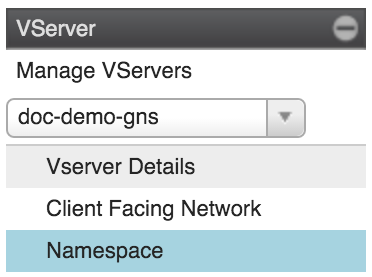 Select the vserver containing the junctions that you want to change. In the table of junctions at the top of the page, identify the junctions that you want to change. Click the checkbox in each junction’s row, then click the Modify button at the top of the table. You can select one junction or multiple junctions. The Modify Junction dialog appears. Make changes in the junction settings in the same way as when adding a junction. Refer to Creating A Junction, above, for details. If you selected multiple junctions, use the Next button to save this configuration and move to the next one. Page numbers at the lower left of the dialog show how many junctions are open for changes. The Skip button moves to the next junction’s page without saving changes on the current page. There is no way to return to a previous page; after saving the last change, you can re-select and modify any junction. After making changes, click Next to save the settings and close the dialog. The (Un)Suspend button toggles the state of the junction between active (online) and suspended (offline). Select one or more junctions by clicking the box in the Actions column. If you select an online junction, clicking the (Un)Suspend button will disable it; if you select a suspended junction, clicking the (Un)Suspend button will make it active. You can change the state of active and suspended junctions at the same time. Deleting a junction does not discard any changes stored in the Avere cluster cache. Any changes to the junction’s data are written to the core filer even if the junction is removed. To delete a junction, select it in the Actions column and click the Remove button. 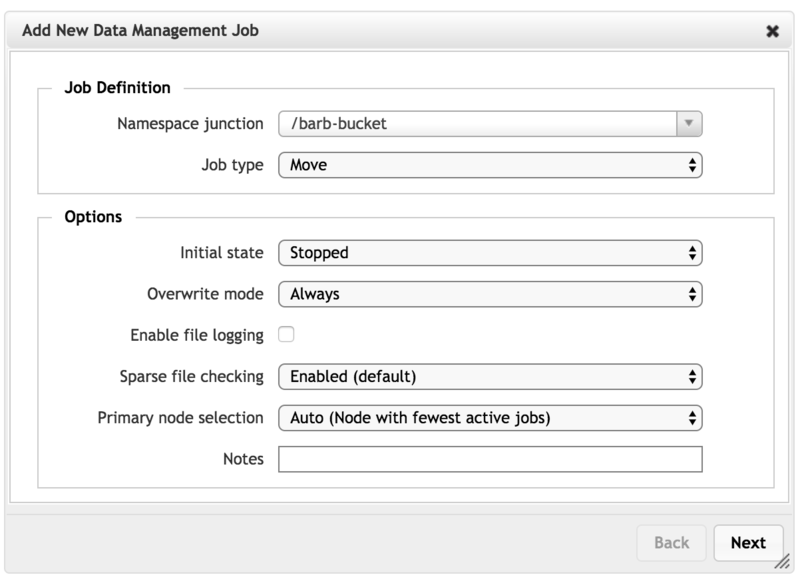 If your system has licenses for FlashMove or FlashMirror, you can create a new data management job from a junction directly from the Namespace page. 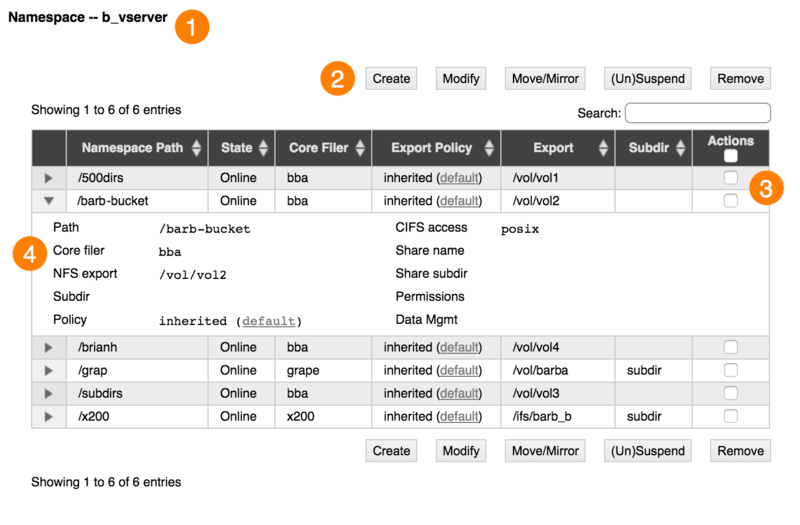 Read Using the Avere Cluster To Move or Mirror Data for complete information about the data management capabilities in Avere OS. Select the junction that will be the data source for your FlashMove or FlashMirror job by clicking its Actions checkbox. If you want to use a subdirectory of the junction as the data source, you must use a custom source definition instead of selecting a junction; you can change the setting in the New Data Management Job wizard. You can create only one data management job, from one junction, at a time. Click the Move/Mirror button above the junctions table. The Avere Control Panel opens the Add New Data Management Job wizard with the junction pre-selected as the data source. The system automatically switches to the Data Management page. Complete the settings in the wizard and click Add Job to create the FlashMove or FlashMirror job. Read Creating a New FlashMove or FlashMirror Job for help specifying the details. Data management features like FlashMove and FlashMirror are licensed separately from the main Avere OS software. If your system does not have a valid license installed, an error message appears when the Move/Mirror button is clicked. Contact your Avere Systems representative for more information.